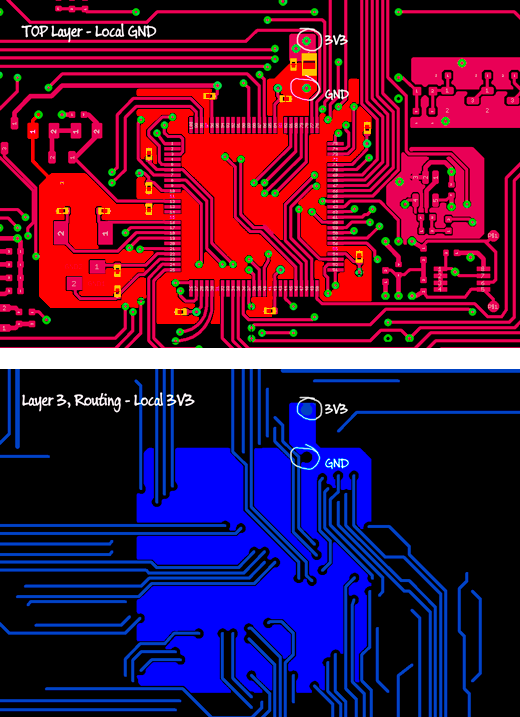 I guess I've been somewhat ignorant when it comes to the finer details of pcb layout. Lately I've read a couple of books that try their best to lead me on the straight and narrow. Here is a couple of examples of a recent board of mine, and I have highlighted three of the decoupling caps. The MCU is a LQFP100 package and the caps are 100nF in 0402 packages. The vias connect to ground and power plane. The top cap (C19) is placed according to best practices (as I understand them). The other two are not. I haven't noticed any problems. But then again the board has never been outside the lab. I guess my question is: How big a deal is this? As long as the tracks are short, does it matter? The Vref pins (reference voltage for the ADC) also have a 100nF cap across them. Vref+ comes from an onboard TL431 shunt regulator. Vref- goes to ground. Do they require special treatment like shielding or local ground? Thanks for great suggestions! My approach has always been to rely on an unbroken ground plane. A ground plane will have the lowest possible impedance, but this approach may be too simplistic for higher frequency signals. I've made a quick stab at adding local ground and local power under the MCU (The part is an NXP LPC1768 running at 100MHz). The yellow bits are the decoupling caps. I'll look into paralleling caps. The local ground and power are connected to the GND layer and the 3V3 layer where indicated. The local ground and power are made with polygons (pour). It's going to be a major rerouting job to minimize the length of the "tracks". This technique will limit how many signal tracks can be routed under and across the package. Proper bypassing and grounding are unfortunately subjects that seem to be poorly taught and poorly understood. They are actually two separate issues. You are asking about the bypassing, but have also implicitly gotten into grounding. For most signal problems, and this case is no exception, it helps to consider them both in the time domain and the frequency domain. Theoretically you can analyse in either and convert mathematically to the other, but they each give different insights to the human brain. Decoupling provides a near reservoir of energy to smooth out the voltage from very short term changes in current draw. The lines back to the power supply have some inductance, and the power supply takes a little time to respond to a voltage drop before it produces more current. On a single board it can catch up usually within a few microseconds (us) or tens of us. However, digital chips can change their current draw a large amount in only a few nanoseconds (ns). The decoupling cap has to be close to the digital chip power and ground leads to do its job, else the inductance in those leads gets in the way of it delivering the extra current quickly before the main power feed can catch up. That was the time domain view. In the frequency domain digital chips are AC current sources between their power and ground pins. At DC power comes from the main power supply and all is fine, so we're going to ignore DC. This current source generates a wide range of frequencies. Some of the frequencies are so high that the little inductance in the relatively long leads to the main power supply start becoming a significant impedance. That means those high frequencies will cause local voltage fluctuations unless they are dealt with. The bypass cap is the low impedance shunt for those high frequencies. Again, the leads to the bypass cap must be short else their inductance will be too high and get in the way of the capacitor shorting out the high frequency current generated by the chip. In this view, all your layouts look fine. The cap is close to the power and ground chips in each case. However I don't like any of them for a different reason, and that reason is grounding. Good grounding is harder to explain than bypassing. It would take a whole book to really get into this issue, so I'm only going to mention pieces. The first job of grounding is to supply a universal voltage reference, which we usually consider 0V since everything else is considered relative to the ground net. However, think what happens as you run current thru the ground net. It's resistance isn't zero, so that causes a small voltage difference between different points of the ground. The DC resistance of a copper plane on a PCB is usually low enough so that this is not too much of a issue for most circuits. A purely digital circuit has 100s of mV noise margins at least, so a few 10s or 100s of uV ground offset isn't a big deal. In some analog circuits it is, but that's not the issue I'm trying to get at here. Think what happens as the frequency of the current running across the ground plane gets higher and higher. At some point the whole ground plane is only 1/2 wavelength across. Now you don't have a ground plane anymore but a patch antenna. Now remember that a microcontroller is a broad band current source with high frequency components. If you run its immediate ground current across the ground plane for even a little bit, you have a center-fed patch antenna. The solution I usually use, and for which I have quantitative proof it works well, is to keep the local high frequency currents off the ground plane. You want to make a local net of the microcontroller power and ground connections, bypass them locally, then have only one connection to each net to the main system power and ground nets. The high frequency currents generated by the microcontroller go out the power pins, thru the bypass caps, and back into the ground pins. There can be lots of nasty high frequency current running around that loop, but if that loop has only a single connection to the board power and ground nets, then those currents will largely stay off them. So to bring this back to your layout, what I don't like is that each bypass cap seems to have a separate via to power and ground. If these are the main power and ground planes of the board, then that's bad. If you have enough layers and the vias are really going to local power and ground planes, then that's OK as long as those local planes are connected to the main planes at only one point. It doesn't take local planes to do this. I routinely use the local power and ground nets technique even on 2 layer boards. I manually connect all the ground pins and all the power pins, then the bypass caps, then the crystal circuit before routing anything else. These local nets can be a star or whatever right under the microcontroller and still allow other signals to be routed around them as required. However, once again, these local nets must have exactly one connection to the main board power and ground nets. If you have a board level ground plane, then there will be one via some place to connect the local ground net to the ground plane. I usually go a little further if I can. I put 100nF or 1uF ceramic bypass caps as close to the power and ground pins as possible, then route the two local nets (power and ground) to a feed point and put a larger (10uF usually) cap across them and make the single connections to the board ground and power nets right at the other side of the cap. This secondary cap provides another shunt to the high frequency currents that escaped being shunted by the individual bypass caps. From the point of view of the rest of the board, the power/ground feed to the microcontroller is nicely behaved without lots of nasty high frequencies. So now to finally address your question of whether the layout you have matters compared to what you think best practices are. I think you have bypassed the power/ground pins of the chip well enough. That means it should operate fine. However, if each has a separate via to the main ground plane then you might have EMI problems later. Your circuit will run fine, but you might not be able to legally sell it. Keep in mind that RF transmission and reception are reciprocal. A circuit that can emit RF from its signals is likewise susceptible to having those signals pick up external RF and have that be noise on top of the signal, so it's not just all someone else's problem. Your device may work fine until a nearby compressor is started up, for example. This is not just a theoretical scenario. I've seen cases exactly like that, and I expect many others here have too. Here's a anecdote that shows how this stuff can make a real difference. A company was making little gizmos that cost them $120 to produce. I was hired to update the design and get production cost below $100 if possible. The previous engineer didn't really understand RF emissions and grounding. He had a microprocessor that was emitting lots of RF crap. His solution to pass FCC testing was to enclose the whole mess in a can. He made a 6 layer board with the bottom layer ground, then had a custom piece of sheet metal soldered over the nasty section at production time. He thought that just by enclosing everything in metal that it wouldn't radiate. That's wrong, but somewhat of a aside I'm not going to get into now. The can did reduce emissions so that they just squeaked by FCC testing with 1/2 dB to spare (that's not a lot). My design used only 4 layers, a single board-wide ground plane, no power planes, but local ground planes for a few of the choice ICs with single point connections for these local ground planes and the local power nets as I described. To make a long story shorter, this beat the FCC limit by 15 dB (that's a lot). A side advantage was that this device was also in part a radio receiver, and the much quieter circuitry fed less noise into the radio and effectively doubled its range (that's a lot too). The final production cost was $87. The other engineer never worked for that company again. So, proper bypassing, grounding, visualizing and dealing with the high frequency loop currents really matters. In this case it contributed to make the product better and cheaper at the same time, and the engineer that didn't get it lost his job. No, this really is a true story. Please bear in mind that these issues are most important for high-speed (>1 MHz) circuits. The first thing to check is if your reference plane can be considered a lumped node, as opposed to a transmission line. If the rise time of your signal is greater than the time light needs to cross from one edge of the board to the other and back (in copper; a good rule of thumb is 8 inches per nanosecond), then you can consider the reference plane to be a lumped element, and the distance from load to decoupling capacitor does not matter. This is an important determination to make, since it affects your placement strategy for power vias and capacitors. If the plane dimensions are larger, then you not only need to spread decoupling capacitors around, you also need more of them and the capacitors need to be within the rise-time distance of the load they are decoupling. Continuing our efforts to minimize inductance, if the plane is a lumped element, then the inductance between part and plane becomes dominant. Consider C19 in your first example. The inductance seen from the plane to the chip is directly related to the area enclosed by the tracks. In other words, follow the path from the power plane, to the chip, then back out the ground pin to the ground plane, finally closing the loop back to the power via. Minimizing this area is your goal, as less inductance means more bandwidth before inductance becomes dominant over decoupling capacitance. Remember, the length of the via from surface to plane is part of the path; keeping reference planes near the surfaces helps a lot. It's not uncommon in 6 or more layer boards for the first and last inner layers to both be reference planes. The lines and vias leading to a load or capacitor don't exist in a vacuum. If there is a supply line, there needs to be a return line. Since these are wires with currents flowing through them, they generate magnetic fields, and if they are close enough to each other, they create mutual inductance. This can be either harmful (when it increases total inductance) or beneficial (when it decreases total inductance). If the currents in each of the parallel wires (I say "wire" to include both trace and via) are going in the same direction, then the mutual inductance adds to the self-inductance, increasing total inductance. If the currents in each wire are going in opposite directions, then the mutual inductance subtracts from the self-inductance, decreasing the total. This effect gets stronger as the distance between the wires goes down. Therefore, a pair of wires going to the same plane should be far apart (rule of thumb: greater than twice the distance from surface to plane; assume the PCB thickness if you don't have your stackup figured out yet) to reduce total inductance. A pair of wires going to different planes, such as every example you have posted, should be as close together as possible. Since inductance is dominant, and (for high-speed signals) is determined by the path the current takes through the net, plane cuts should be avoided, especially if there are signals crossing that cut, since the return current (which prefers to follow a path directly under the signal trace to minimize loop area and thus inductance) has to make a large detour, increasing inductance. One way to mitigate the inductance created by cuts is to have a local plane which can be used to jump over the cut. In this case, several vias should be used to minimize the length of the return current path, however, since these are vias which go to the same plane, and thus have current flow in the same direction, they should not be placed close to each other, but should be at least two plane distances or so apart. Care should be taken, though, with signal traces that are long enough to be transmission lines (i.e. over one rise or fall time in length, whichever is shorter), because a ground fill near the trace will change the impedance of that trace, causing a reflection (i.e. overshoot, undershoot, or ringing). This is most noticeable in gigabit-speed signals. I'd go into how the "one 0.1 uF capacitor per power pin" strategy is counterproductive with modern designs that can have tens of power pins per part, but I really have to go to work now. Details are in the BeTheSignal and Altera PDN links below. Move decoupling capacitor vias closer together, if those vias go to different planes. Putting the via in the pad is the best option, if you can afford it (you need to fill the via and plate the pad over the fill, which adds a day or two to fabrication and costs more money). 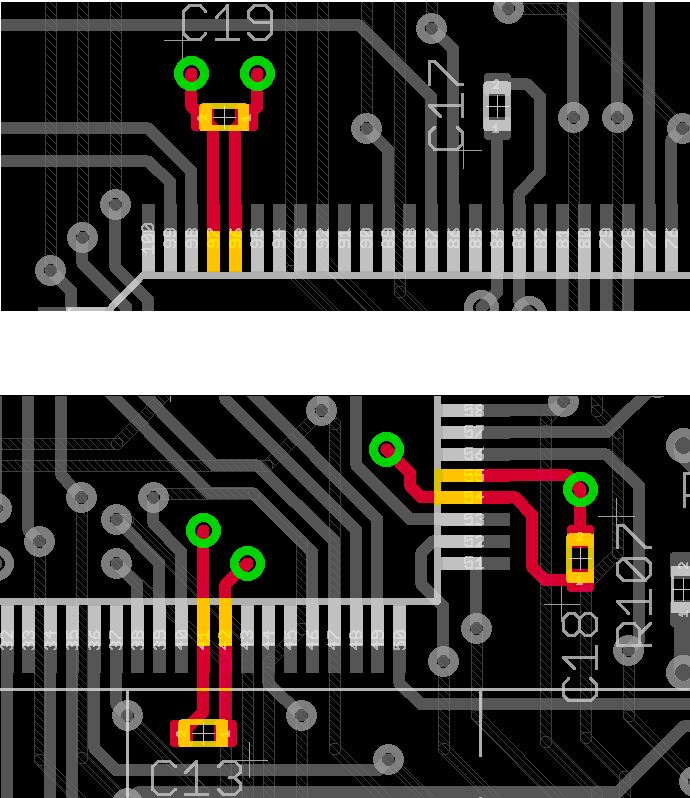 Second best is to put the two vias on the same side of the cap, as close as possible to each other and the capacitor. An additional set of vias can be placed on the opposite side of the capacitor to cut the inductance in half, but make sure that the two via groups are at least a board thickness (or two plane distances) apart. Minimize the longest dimension of each reference plane to minimize inductance and allow the simpler lumped-element model for your plane. Plane cuts should be minimized, and local planes can be used to mitigate them. Altera's Power Distribution Network design tool and app note -- These are focused on Altera products, but the basic strategies are relevant to any high-speed digital design. The PDN tool is great for calculating plane impedance given physical parameters and decoupling capacitors. Puts the "one 0.1 uF cap per power pin" myth to bed by showing you what really happens. I find it tends to help to think about the equivalent RC circuits the traces form, when you need to consider the behavior of the power lines (traces, e.g. really small resistors) and decoupling caps. There is no polarity in the image, so just assume one "Power" is ground, and the other is VCC. There are basically two approaches to decoupling - A and C. B is not a good idea. A will be most effective in keeping noise from the IC from propagating back into the power rails of your system. However, it is less effective at actually decoupling switching currents from the device - The steady-state current and the switching current have to flow through the same trace. C is most effective at actually decoupling the IC. You have a separate path for switching currents to the capacitor. Therefore, the high-frequency impedance of the pin to ground is lower. However, more switching noise from the device will make it's way back to the power rail. On the other hand, this does result in a net lower variance of voltage at the IC pin, and reduces the high-frequency power supply noise by shunting it to ground more effectively. The actual choice is implementation specific. I tent to go with C, and just use multiple power rails whenever possible. However, any situation where you do not have the board space for multiple rails, ,and are mixing analog and digital, A may be warranted, assuming the loss in decoupling efficacy causes no harm. C has two separate AC paths to ground, whereas A has only one. The answers to your questions (all of them) depend a lot on what frequencies are running around your PWA. Regardless of anything else I am about to say, remember that most discrete decoupling caps become useless above about 70 MHz. Using multiple paralleled caps can push that number a bit higher. A rule of thumb is that an object begins acting like an antenna at L = wavelength/10. Wavelength = c/f; so we need L < c/(10f). Feature sizes of 1 cm become important at around 3 GHz. Before you breathe a sigh of relief (because your clock only runs at, say, 50 MHz) remember that you need to think about the spectral content of clock edges and chip I/O pin transitions. In general, you want to put a lot of caps around the board, and/or use a board with specially designed power and ground planes, which basically turn the entire board into a distributed capacitor. Lead and trace inductance (L) is about 15 nH/inch. That equates to about 5 Ohms/inch for spectral content at 50 MHz, and about 20 Ohms/inch for spectral content at 200 MHz. Paralleling 'N' caps of value C will increase C by a factor of N and reduce L by about a factor of N. Your decoupling scheme has a useful frequency range. The LOW end of that frequency range is set by the total effective capacitance of all your caps. The HIGH end of the frequency range has nothing (I repeat, nothing) to do with the capacitance of your capacitors: It is a function of the lead inductances of your capacitors and the number of capacitors (and their placement) in the network. The effective overall inductance is inversely proportional to N. Ten caps of 10 nF each are highly preferable over 1 cap of 100 nF. 100 caps, of 1 nF each, is even better. To keep your EFFECTIVE decoupling network C high, and your EFFECTIVE decoupling network L low, you must distribute your caps (not clump them in one or a few places). Protecting your A/D conversions from noise is a whole nother subject, which I will pass on at the moment. I hope that helped answer some of your questions. 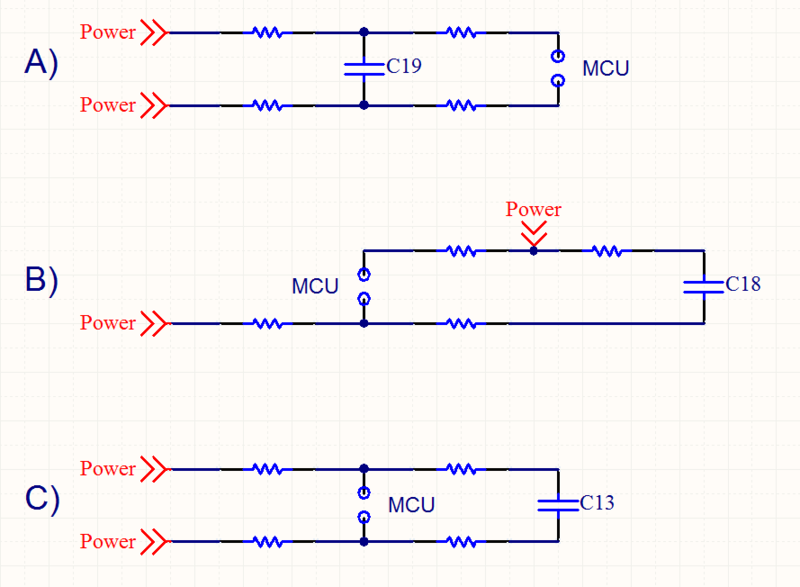 Diagram (A) in Fake Name's answer is by far the best one for minimizing changes drawn on the supply wires, since changes in the current drawn by the CPU will have to change the cap voltage before they can cause any change in the supply current. By contrast, in diagram (C), if the inductance to the main supply were ten times that going to the bypass cap, then the power supply would see 10% of any current spikes regardless of how big or how perfect the cap might be. Diagram (C) is probably the best from the perspective of minimizing changes in the voltage between VDD and VSS. I would guess that it's probably more important to minimize variations in the supply current, but if it's more important to keep the VDD-VSS voltage steady, diagram (C) might have a slight advantage. The only advantage I can see for diagram (B) is that it probably minimizes differential voltage between VDD and the board's positive supply rail. Not really much of an advantage, but if one were to flip the rails, it would minimize the differential voltage between VSS and ground. In some applications that could be important. Note that artificially increasing the inductance between the positive supply rail and VDD might help reduce the differential voltages between VSS and ground. As a side note separate from the layout issue, note that there are reasons to use an assortment of capacitor values (e.g. 1000pf, 0.01uF, and 0.1uF) rather than just 0.1uF capacitors throughout. The reason is that capacitors have parasitic inductance. Good ceramic capacitors have a very low impedance at the resonant frequency, with the impedance dominated by capacitance at lower frequencies and dominated by the parasitic inductance at higher frequencies. The resonant frequency generally decreases with increasing part capacitance (mainly because inductance is about the same). If you use only 0.1uF capacitors, they give you good performance at lower frequencies, but are limiting your high frequency bypassing. A mix of capacitor values gives you good performance at a range of frequencies. I used to work with one of the engineers who did the schematic design + layout for the Segway motor drive, and he got the DSP's analog-to-digital converter noise (primary source being the DSP system clock) down by a factor of 5-10 by changing capacitor values and minimizing ground plane impedance using a network analyzer. There's a yet another trick in minimizing the impedance between the internal GND and VCC rails in the MCU, and the power planes. Every unused MCU I/O pin should be connected to either GND or VCC, chosen so that roughly the same number of unused pins goes to VCC as to GND. Those pins should be configured as outputs and their logic value should be set according to what power rail the output is connected to. That way you provide extra connections between the MCU's internal power rails and the power planes on the boards. These connections simply go through the package inductance and ESR, and the ESR of the mosfet that's turned on in the GPIO output driver. This technique is so effective at keeping the MCU's interior tied with the power planes that sometimes it pays to choose the a package for a given MCU that has more pins than needed, just to increase the number of redundant power pins. If your board manufacturer can tackle it, then you should also prefer leadless (LCC) packages as they usually have lower board-to-die inductance. 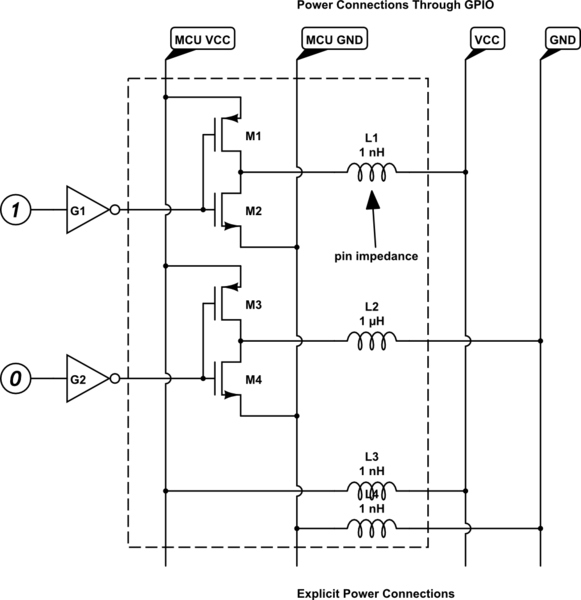 You might want to verify that by consulting the IBIS model for your MCU, if there is one. It's always best to adopt good practice, especially as it doesn't involve any more work or cost in this type of design. You should have the vias as close as possible to the capacitor pads, to minimise inductance. The capacitor should be close to the supply and ground leads of the chip. The routing in the second image should be avoided, and the first isn't ideal. If that is a prototype, I'd modify the decoupling for the production version. Apart from the chip malfunctioning in some circumstances, you could be increasing unwanted emissions. Even though your design "works" as is, in my experience, I found out that if you don't do a "good" job at decoupling and bypassing, your circuits will be less reliable and more susceptible to electrical noise. You may also find that what works in the lab, may not work in the field. Not the answer you're looking for? 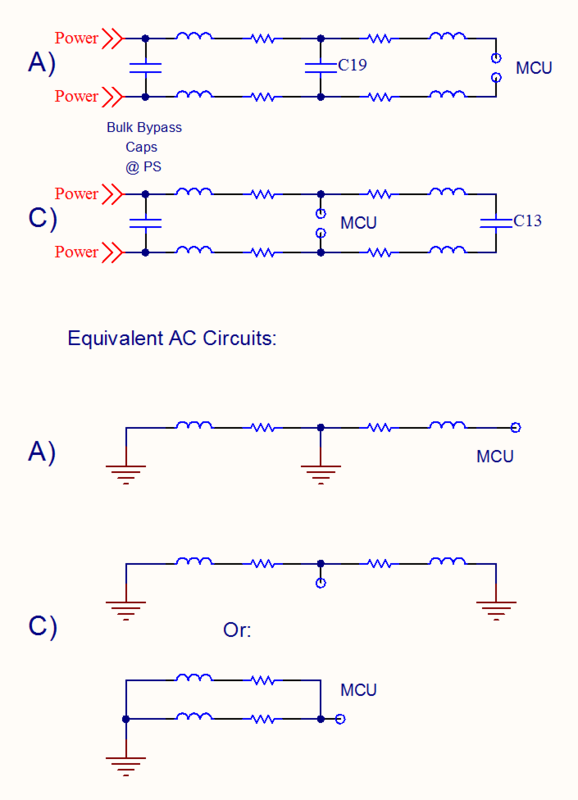 Browse other questions tagged pcb layout decoupling-capacitor or ask your own question. Decoupling caps near ICs, but how much near? What is a decoupling capacitor and how do I know if I need one? What are the advantages of having two ground pours? Forgot to put a via near bypass capacitor, and now the boards have been fab'd - what can I do? How do I facilitate keeping multiple grounds, (i.e. AGND, DGND, etc…) separated in the layout when using Eagle? Decoupling capacitors on the bottom layer? Decoupling cap on backside: Create separate via?